Tony, Congratulations and best of luck to you! You have been an inspiration to work with and I have learned so much from you. I hope you will keep blogging about your experiences in Boulder. All I can say is that Boulder is so lucky to land a Director with such a great amount vision and experience on how to build success and develop great staff! PLCMC has been blessed by your energy and talent. All my best Tony on your future at BPL! Congratulations! Boulder is lucky to get you. Please keep blogging! Hello Catie & Helene & Lori! Thanks very much to all my friends for their kind words and encouragement. This has been a big decision (and I feel really great about it). I will keep blogging, too. There will surely be so many new things to discover and wonder about in this beautiful new place. Well, now. Haven’t you landed in a pot of jam! Boulder is great. Although Charlotte was extraordinary in so many ways. What a tough call. I hope we can count on you to give us Culture Scouting from Boulder, Tony. All of your fellow Culture Scouts are over the moon for you in this new role. Please keep us tuned into your observations and ideas as you make your way. You bet, Boulder is utterly fantastic and I am looking forward to becoming a part of the staff who are making the Library such an important part of the city. I’ll keep you and all the Culture Scouts posted on all my delicious finds and discoveries! Congrats Tony….sounds like an exchange between Boulder and Australia needs to be considered!!!!! I am thrilled about moving to Boulder and stepping into this role. Boulder is absolutely beautiful–on many levels! I believe the US partnership with Australia be very enriched by exploring Boulder! Congratulations! 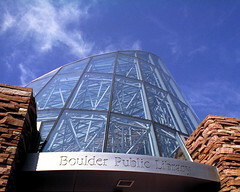 I look forward to watching the evolution of the Boulder Public Libraries with your leadership! that sure is a nice promotion, congratulations! Had a nice time talking to you and Helene at CIL, future planning was one of the many things we talked about. Good to see you’re doing well on that! Great to hear from you! I’m gearing up for the move to Boulder and very thrilled about it. Great place to be. When you come back to the states, please make it a point to swing by Boulder. Oh, the rock band, rock fest, rocking the world? That’s still happening and going to happen more. The first band we’re opening the season with this Sunday is ‘They Might Be Giants.’ Both shows sold out early on. So the rocking will keep on happening (wherever I go). Hello to Lizabeth and all my European friends!